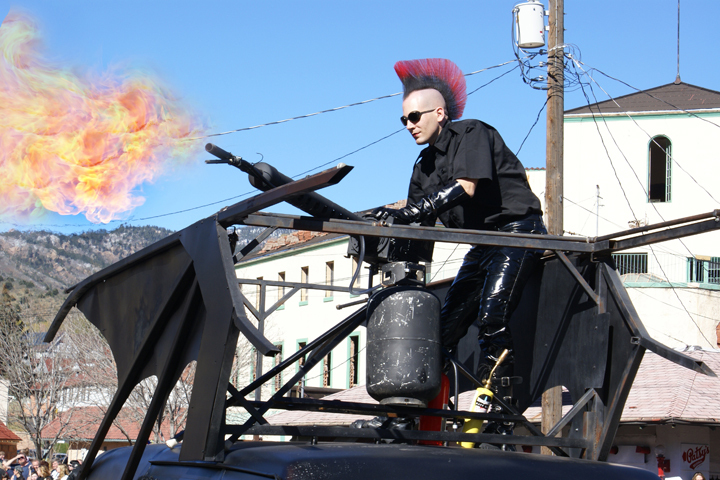 The annual Emma Crawford Festival and Coffin Races in Manitou Springs is certainly one of the oddest celebrations in the country. Held each October in Manitou Springs, Colorado (a small town of about 5,000 outside Colorado Springs), this one-day event honors the passing of the town’s most famous former resident, Emma Crawford. Emma Crawford was a young woman who came from South Royalston, Massachusetts to Manitou Springs for fresh Rocky Mountain air to help her battle tuberculosis. At age 28, Emma passed away in December 1891 and requested to be buried atop Red Mountain, which overlooks the town. Her body remained in that location until 1912, when the Louisville and Nashville Railroad Company did some work on Red Mountain and moved her coffin to the south slope. Unfortunately, rains and other turbulent weather loosened the soil and rocks, resulting in Emma’s coffin sliding down the mountain and onto the main thoroughfare of Manitou Springs. Photo by Andra DuRee Martin. It wasn’t until 1994 that someone got the idea of racing coffins along Manitou Avenue and making a day of it. This annual event begins with the Parade of Coffins along Manitou Avenue, which is led by a string of hearses and the Mantiou Springs Chamber of Commerce Pace Coffin. Once the parade ends, the coffin races begin! 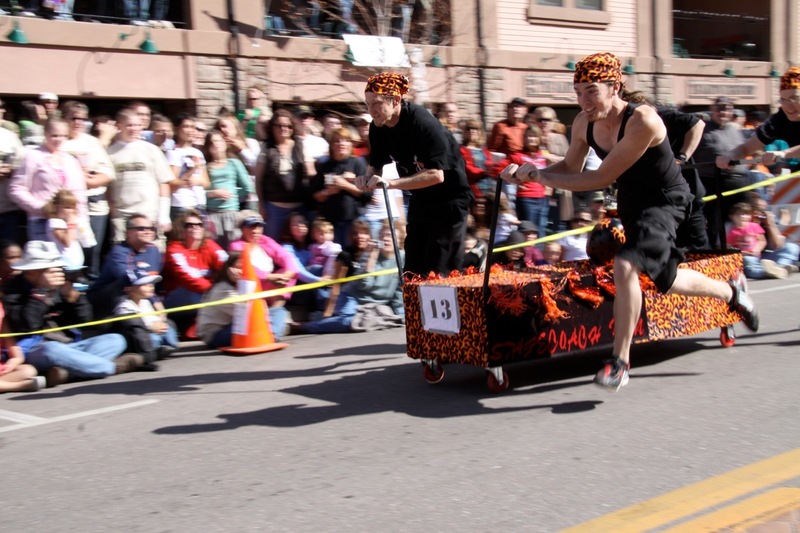 Each year, 50 coffin race teams go for glory by racing and riding coffins along a 585-foot stretch of Manitou Avenue. Each coffin racing team must be composed of four members, including one “Emma” who is required to ride in the coffin with a helmet. Locals and tourists alike enjoy this outdoor, wacky event where they get to show off their craftsmanship, wear outrageous, spooky costumes and simply ride through the center of town on a homemade coffin. 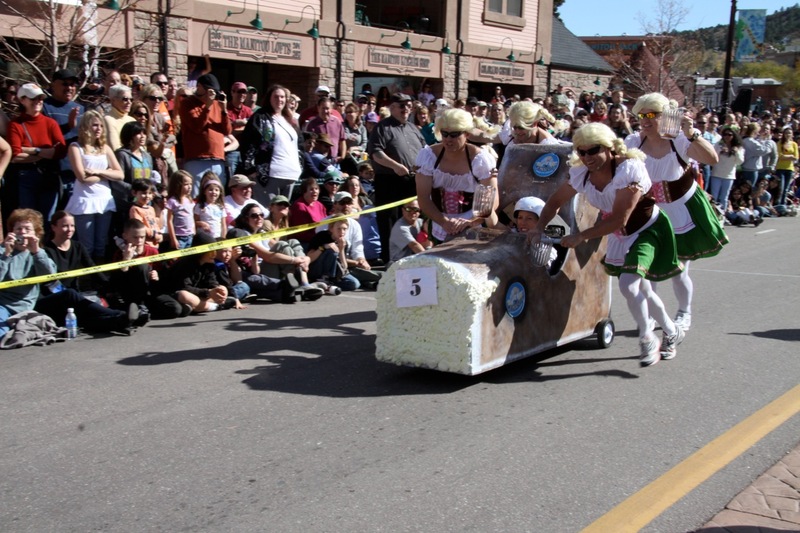 The spots for the coffin race fill up quickly and the October 21 deadline has already passed for your 2011 entry, but if you and your friends are ever looking for a fun way to celebrate Halloween, enjoy the outdoors and honor a young woman who loved these mountains, then the Emma Crawford Festival and Coffin Races is exactly what you need. Manitou Springs is located about 15 minutes west of Colorado Springs on US-24 West and 90 minutes south of Denver via I-25 South to US-24 West. The 17th annual Emma Crawford Coffin Races will be held on Saturday, October 29, 2011 from 12 pm to 3pm. Have you even been to the Emma Crawford Festival and Coffin Races? Tell us about it! Let us know what you think! Follow us on Twitter and like us on Facebook to give us a shout. You can also stay on top of exciting events from around the world by downloading the eventseeker app for iPhone, Android or Windows.